Ruapekapeka Pā was the final battleground in the war of the north that initiated from Ngāpuhi resentment at the biased governance of the British, especially in relation to land ownership. In late December 1845, four or five hundred warriors led by Hone Heke of Ngāpuhi and Te Ruki Kawiti of Ngāti Hine faced one thousand British troops along with four hundred Ngāpuhi warriors allied with the British. The British bombarded the pā with heavy artillery for ten days, before commencing a frontal assault in early January 1846. The design of the pā, with extensive earthworks, trenches, bunkers and palisades resulted in little damage and few, if any, casualties to the defenders during the bombardment. At the time of the final attack the pā was mostly empty, with most of the defenders behind the pā site. The fighting commenced, with most British casualties resulting from ambushes in the woods behind the pā. The pā site was chosen specifically for battle and a tactical withdrawal after sufficient damage: There was no strategic value in the location, no surrounding villages or resources were gained. The result of the battle was a stalemate. The British lost 12 men with 29 wounded, in order to capture a pā site with no inherent value. The defenders suffered between 9 and 25 deaths and prevented the capture of Hone Heke and Te Ruki Kawiti. The British claimed victory, but in the end both sides agreed to end the fighting, and Governor Grey issued pardons for all involved in the “rebellion”. Today, this unique and valuable historical site is a Department of Conservation reserve, managed with the Ruapekapeka Trust. The site is wahi tapu, as a place where warriors and soldiers fell. No food or drink should be taken onto the pā site. Immediately behind the pa, to the south is Timperley’s Bush Scenic Reserve, gifted by B. R. Timperley in 1982 in order to preserve a large puriri tree. 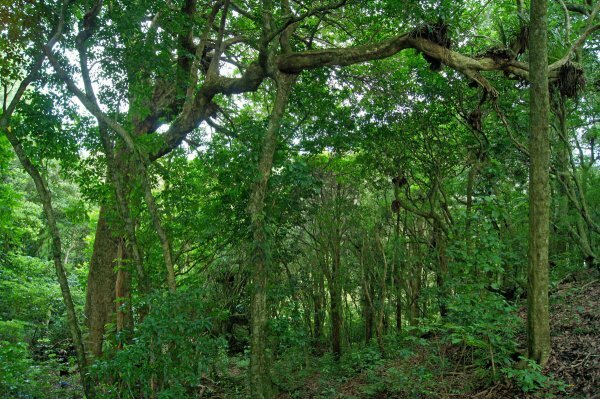 The tree is about 5 minutes walk through a grove of other puriri, tawa, and kohekohe. It has an impressive 10 m tall trunk and a large girth for the species. 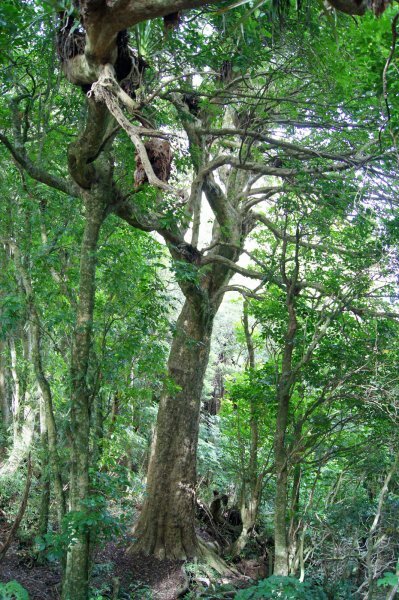 Most fascinating is one branch extending horizontally for a distance of 20 m. About half way along, a kohekohe has grown up under the branch, and formed a crutch providing unusual support to the branch. Burstall and Sale, Great Trees of New Zealand, 1984, pg 31. Taken 1.4 m above mid-slope. An old tree, but still vigorous foliage. A long, horizontal branch extends to 20 m from the trunk, supported by another tree. Ruapekapeka is signposted a few kilometres south of Kawakawa, on SH1. The entry to the scenic reserve and the path to the tree is well signposted at the rear (south) of the pā.